Is this a one-time fee, or are there any renewal fees? When you purchase Never Miss A Sign you are buying a Lifetime License that allows you, personally, to use it for the rest of your life. There are no hidden fees or extra charges. $174.95...Lifetime Access! Do I get anything in the mail? No. Never Miss A Sign is in the cloud so once you register you have Immediate Access. You don't have to wait to receive anything in the mail. Simply Login and you will be asked to enter your username and password. Once you do that, you're in! Can I use the wristbands for offense and defense? Yes! 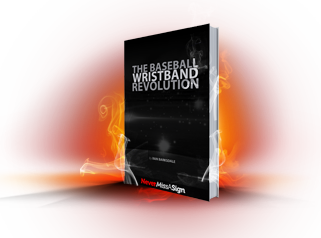 You can generate completely custom wristbands for baseball or softball that allow you to use signs for offense, defense, or both...whatever is best for your team! Where do I get the actual wristbands? Now you can buy your wristbands right here at Never Miss A Sign! We have wristbands for girls and guys, youth and adult players, AND they come in 6 different colors. Learn more about Never Miss A Sign Wristbands by clicking the link. All orders must be placed through this website using a credit card. PayPal handles the credit card processing, but you do not need a PayPal account. Simply choose "Pay with Card" and you'll be set. Do you accept school purchase orders (POs)? No, the only method of payment that is accepted is an order placed on the website using a credit card. One of the ways I'm able to keep my prices so low is by keeping everything digital (think Esurance.com). Who owns the Lifetime License, the school or the coach? The License is owned by the individual who purchases Never Miss A Sign and it is non-transferrable to another individual. So, if you purchase it while coaching at one school/university, and move to another, you still own the Lifetime License NOT the school you previously worked for. So, once you buy it, you have it forever! Are there any minimum requirements for my computer? No. Never Miss A Sign software is stored in the cloud so you can use any device with an Internet connection. This includes desktops, laptops, smart phones, and tablets. As long as you can connect to the Internet and have access to a printer you are good to go! Can I share an account with someone? No, a Lifetime License is issued to an individual and may not be shared. Each person who wishes to use Never Miss A Sign must purchase their own license. For more information about sharing passwords please read the Terms and Conditions. My Coach's Sheet and Player Card don't match? If you think your player's card and coach's sheet don't match you're probably reading the card wrong. Make sure you locate the numbers at the top of each block FIRST, and then find the corresponding number going down the side. I already own a Lifetime License, but I want to upgrade. How do I do this? Upgrading to version 3.0 is easy! All you have to do is log into your account and then you'll see instructions on how to upgrade. It will take less than 2 minutes and you'll receive the upgrade at a discounted price for being a loyal customer. Most of your questions can be answered by watching the How It Works video. However, if you have a question that you can't find the answer to please send me an email by going to the Contact page.